The hosting of APEC 2018 in Port Moresby has only made one thing clear. The country needs more upmarket accommodation for business travellers. Although the inclusion of The Stanley Hotel and the STAR Mountain Hilton have somewhat remedied the direness of the luxury accommodation deficit, there is still room for more post- APEC. Investors could develop an additional hotel with conference facilities to help alleviate shortages of both accommodation and conference facilities. In other coffee-producing countries including Guatemala and Indonesia, luxury resorts have been developed within coffee plantations to creating an almost niche experience for coffee aficionados. This opportunity also exists in Papua New Guinea where such a resort could focus on gastronomy and fine coffee, providing plantation tours and comparative coffee tastings. Depending on location, such an enterprise could partner with local tour operators to incorporate bird watching, fishing or other activities to expand activity choices for guests. This mostly probably occurring in the Highlands regions where coffee grows in abundance. A need exists for improved customer service across hospitality, transport, F&B and the delivery of tourist products. Investors could negotiate with private sector tourism providers and the government to run high-quality, professional courses for all sectors of the tourism industry. 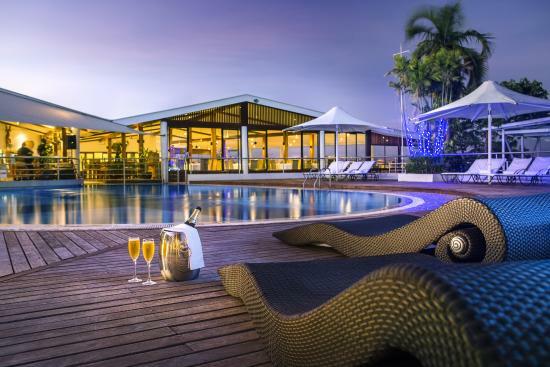 Port Moresby does not have a purpose-built conference facility and existing facilities within hotels are heavily utilised. Investors could develop a conference facility capable of accommodating meetings and conferences of varying sizes, with overall capacity for at least 500 delegates. The facility would target public and private sector business meetings, domestic conferences, international conferences, displays and exhibitions. Investors willing to work with local communities and turtle-monitoring programme scientists could investigate the development of an ecotourism resort with a focus on observing leatherback turtles. As the season is limited to four months, the resort could also act as a base for tours into the Labu Lakes and Bula Falls and to war relics near Salamaua. The coastal area also provides good snorkelling. Tourists attracted to Papua New Guinea for leisure activities are obliged to spend at least one night (often two) in Port Moresby due to limited airline connections. These travellers resent the stay and, even more so, resent paying for upmarket accommodation simply to feel safe. Investors could develop value for money accommodation with an emphasis on security.